Tickets for June’s CONCACAF Gold Cup doubleheader – the Confederation of North, Central America and Caribbean Association Football, of course – at new 19,400-capacity Allianz Field have sold out. United's website directs people who want to purchase them to the resale market. Officials of host Minnesota United FC say it's the earliest a Gold Cup match has sold out. The June 18 games, featuring the U.S. national team’s opening game in Group D play under newly named coach Gregg Berhalter, will be the St. Paul stadium’s first international sporting event. Click here for venues and dates. The complete group and schedule will be announced in 2019 once all qualifying rounds -- the last one is in March -- are completed. Six of 16 national teams that will participate have qualified so far: The United States, Costa Rica, Honduras, Mexico, Panama and Trinidad and Tobago. 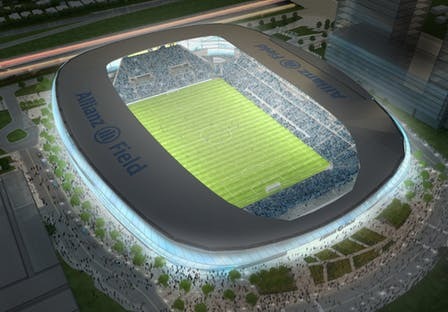 Minnesota United held a news conference Tuesday at the new stadium to announce that St. John’s and St. Thomas will renew their long rivalry in the first American football game held at Allianz Field, on Oct. 19, 2019. Here’s colleague Mike Rand’s story about it.